Brad Bird’s fascinating, if under performing, Tomorrowland arrives on Blu-ray/DVD/Digital HD combo pack from Disney. It’s worth taking a second look at anti-dystopian fantasy starring George Clooney. 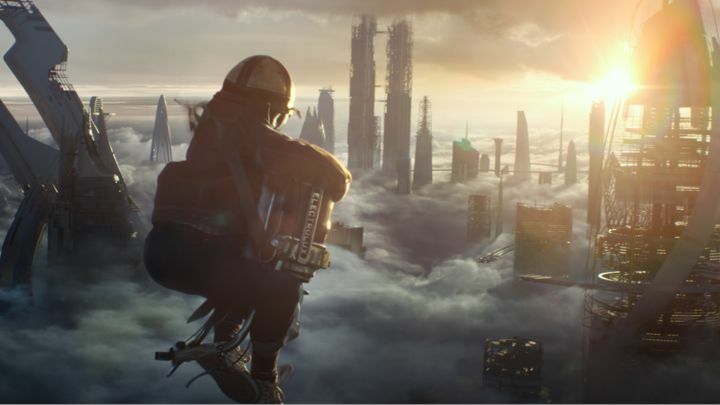 The secret to Tomorrowland for Bird is that it’s more about the journey than the destination, which explains why it’s such a subversive Disney fantasy/adventure and why it wasn’t a box office hit. The Blu-ray, however, is demo quality picture and sound and is chock full of bonus features, including the animated short, “The Origins of Plus Ultra” (watch below), “Remembering the Future: A Personal Journey Through Tomorrowland with Brad Bird, ” “The World of Tomorrow Science Hour” (hosted by Hugh Laurie’s David Nix), deleted scenes. “One of the goals was to put the audience in the position of Casey and have them feel like they’re experiencing it the way she’s experiencing it… it’s continuous and she’s rushing to take it all in and there’s almost too much,” Bird suggested. “If you’e looking at this thing over here, you’re missing something over there. And so it’s like a kid in a candy store. And there’s this panic at the end: maybe it’s not gonna last much longer and then it’s gone. It’s like a flying dream that you wake up too soon out of. Inevitably, Tomorrowland became personal for Bird. It’s about dreamers everywhere and fulfilling your vision without it being fatally compromised.